CARL OLSEN: "This bud's for you"
but almost went to prison for resisting the draft. and said my religion does not allow me to kill people. God made it, wicked governments hate it. with 20 tons of marijuana on board. and the illegal profits that generates. Just think of Al Capone and the bootlegging industry. by keeping them drunk all the time. 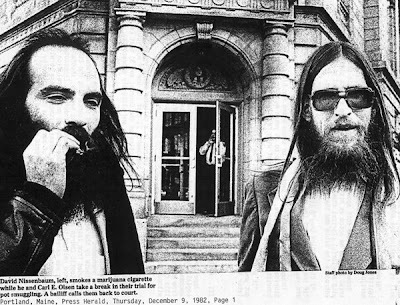 a break in their trial for pot smuggling. A baliff calls them back to court. 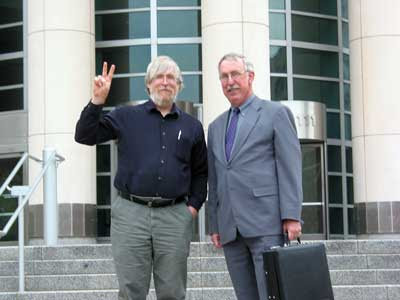 Carl Olsen and Jim Cook outside the Eighth Circuit Court of Appeals. CARL OLSEN, 57, lives in Des Moines. 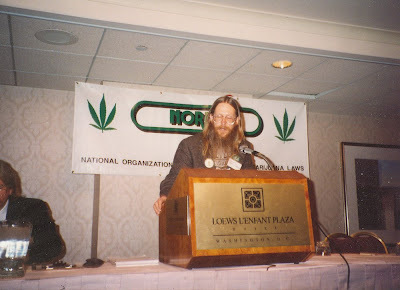 For about three decades he has been working for reform of United States marijuana laws. He is a web developer for the ACLU, the Iowa Democratic Party for the Third Congressional District, and a couple neighborhood associations in his spare time, and he also works at a Des Moines area university as a web developer. You have been dealing with this marijuana thing for a long time. I was born in Marinette, Wisconsin. I went to school in Des Moines, Iowa. I’ve never served in the military, but almost went to prison for resisting the draft. I showed up at the induction center with a Bible and said my religion does not allow me to kill people. NAD: Can you briefly summarize your marijuana case? Where does it stand now? Any end in sight? I have four marijuana cases, three in federal court and one state court. One is about my religious use of marijuana, and that one has been filed in the U.S. Supreme Court last December. In January, the U.S. Supreme Court requested a response from the U.S. Attorney General and that response is due on April 1, 2009. The other three are related to medical use. Federal courts generally recognize that religious use cannot be denied where medical use is allowed, so I'm establishing that medical use is recognized under both state and federal law. Both federal and state law say that marijuana has no accepted medical use in treatment in the United States because it actually had no recognized medical use when those laws were written. What may have been true in 1970 when those laws were enacted is no longer true. Thirteen States in the United States have accepted the medical use of marijuana since 1996 and the times they are a changin’. Both state and federal law are now outdated and must be amended according to their own plain language. NAD: Why is your case important in regard to the larger, national drug law issue? The Obama Administration is saying it will not enforce federal drug law against medical marijuana users in states that have enacted medical marijuana laws. That is a dumb thing to say when the language of the federal drug law actual gives the states the authority to determine accepted medical use. The Drug Enforcement Administration (DEA) is in violation of federal law. President Obama needs to tell the DEA it’s illegal to arrest medical patients instead of telling them to stop enforcing federal law. The federal drug law requires the DEA to amend the listing of marijuana in the federal drug law, and that's what they should do. The law is not broken, it's not being enforced as it was written. Marijuana automatically gets reclassified when states enact medical marijuana laws. It's so simple, a genius like Obama can't see it (or worse, doesn't want to see it). NAD: Is the drug war still ongoing? What was that all about anyway? Didn't that all kind of start in the '80s, about the same time as the Iowa farm crisis? Would it be reaching to take a stab and say the drug war was cover for the farm crisis? Is there any end in sight to the war? The drug war is just another one of the phony crises that the government invents to keep our eyes off the corporate scoundrels who are stealing our money. Take pharmaceutical companies for example, they don’t want you growing medicine in your back yard. What would that do to corporate profits? In fact, what would the financial system do without all that illegal drug money flowing through it? Legalization of drugs would seriously disrupt the flow of money from illegal markets to legal ones, and most of the financial industry has already tooled up for a lengthy drug war and the illegal profits that generates. Think of people like Joe Kennedy, father of President John Kennedy, who was a bootlegger. NAD: This Bud's For You. How does all that tie in with the ol' drug war? She’s a big whig for one of the largest Anheuser-Busch beer distributors in the United States. Again, what’s marijuana going to do to the stock portfolio? If you want peace, you get everyone high on marijuana. If you want war, you keep them in the dark by keeping them drunk all the time. Alcohol promotes violence. Marijuana promotes peace. NAD: Have you ever been to prison? If so, can you talk about your experience? If not, then great. I spent two years in prison, from 1984 to 1986, for unloading a boat with 20 tons of marijuana on board. My job in prison was running the prison law library. 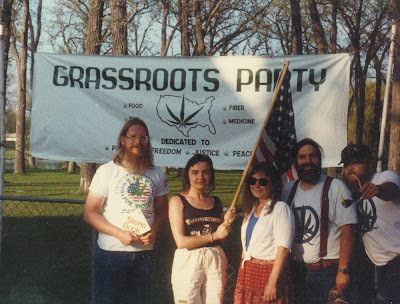 I learned about the federal medical marijuana hearings and joined in. 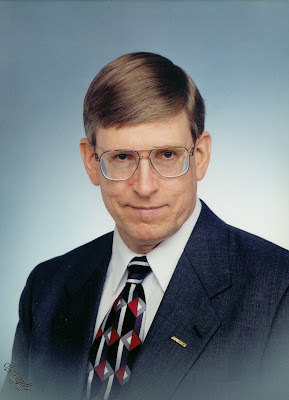 Before I went to prison, I participated in a study on cognitive function at UCLA which was published in Science Magazine, so I used that that study as grounds for joining the DEA administrative hearings. The result of those hearings was a ruling by the judge that marijuana, in its natural form, is one of the safest therapeutically active substances known to man. Your questions are perfect. Thanks! The U.S. Supreme Court denied my petition for writ of certiorari on my religious claim on May 4, 2009. I've been working on this for about 30 years, so the net result is that the courts are telling me I have to get the laws changed by either: (1) repealing marijuana prohibition; or (2) getting an exemption like the Iowa and federal exemption for the sacramental use of peyote by the Native American Church. In both cases, the Iowa Legislature and Congress, have delegated their authority to modify the drug laws to administrative agencies. 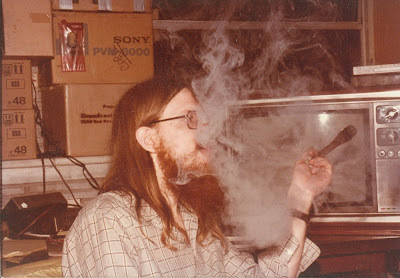 I filed a petition for an exemption for my sacramental use of marijuana with the DEA in 1983 and it was rejected. I've never filed one with the Iowa Board of Pharmacy, so I'm in the process of doing that now. There are a couple of keys to getting exemptions. One is state law, and the other is being able to show that other people are being exempted. For example, the U.S. Supreme Court rejected a sacramental claim for peyote in 1990 because the state where the Native American Church was claiming the exemption, Oregon, did not have a state law exempting the sacramental use of peyote by the Native American Church. Oregon did not allow anyone to use peyote, so the the U.S. Supreme Court held that was sufficient to deny a religious claim. Obviously, some states allow people to grow and distribute marijuana for medical purposes, so a religious claim for marijuana in those states should succeed. Iowa seems to have a medical exception for marijuana, but it's difficult to understand and it hasn't been used to actually allow anyone to use marijuana. I have a case pending against the Iowa Board of Pharmacy complaining that the Iowa law says marijuana has accepted medical use but no one is being allowed to use it, creating a violation of due process. I won the first round in Polk County District Court on April 21, 2009, but the court ordered the Iowa Board of Pharmacy to reconsider my petition. On June 1, 2009, the Iowa Board of Pharmacy simply rejected the petition again without allowing me to speak or add anything to the record. We are waiting for a written ruling from the Iowa Board of Pharmacy and we'll be taking them back to court again for violating the April 21, 2009 order of the court.